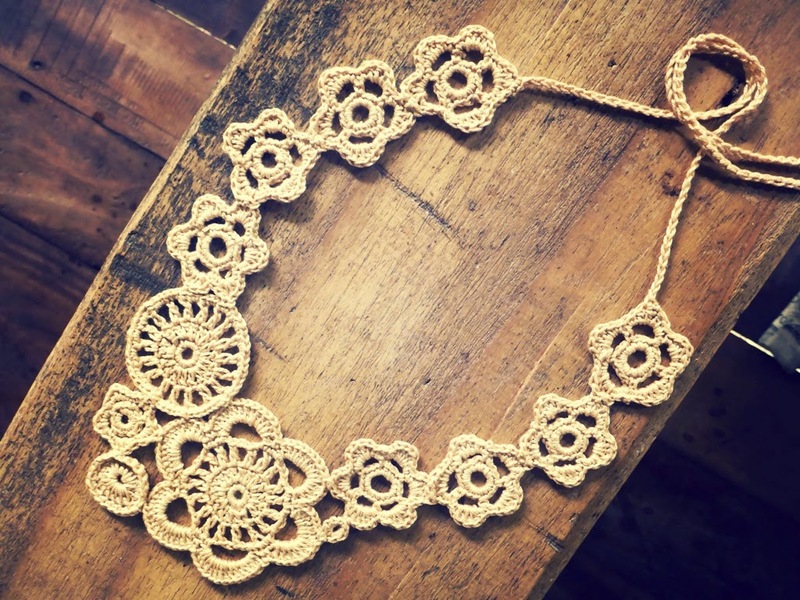 Carapacioue is a crocheted necklace made up of join-as-you-go motifs. 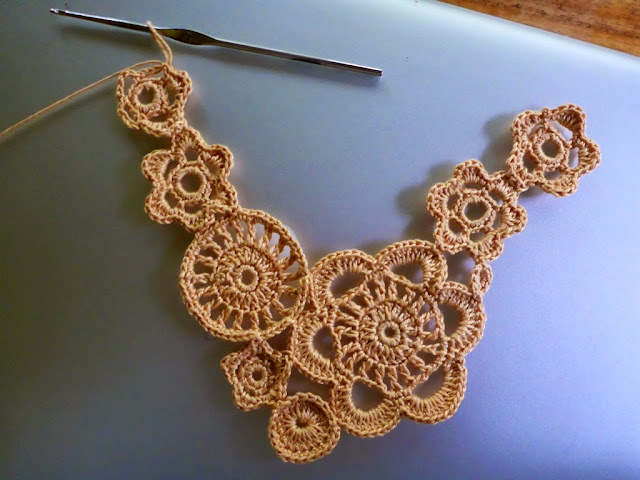 I made this pattern because I love motifs but sometimes don’t fancy sewing them together. Most of the motifs in the necklace are from Zhurnal Mod crochet and knit magazine from Russia. 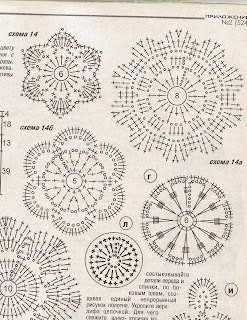 Some of the motifs are modifications of those found in the magazine. 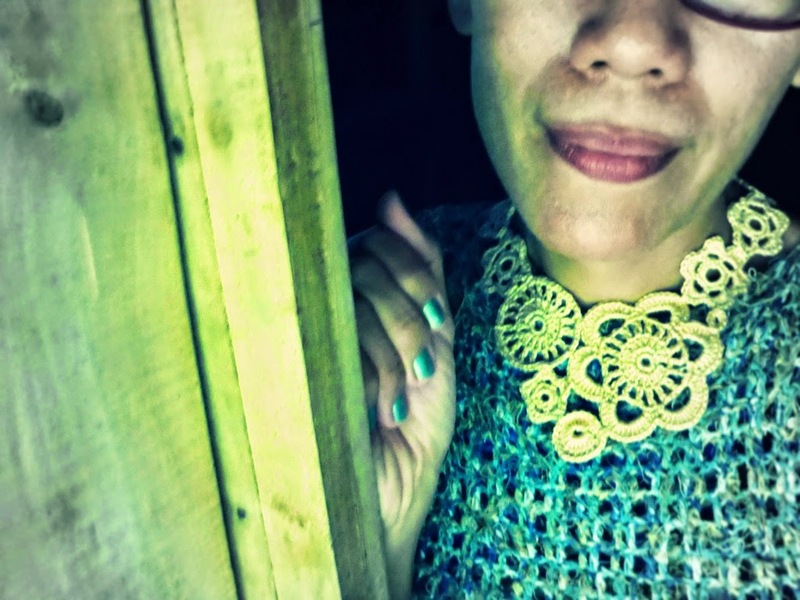 I started making this necklace by making the first big motif. Then I made a smaller motif and joined that to the big motif. Then I made a modification of the first motif and joined that to the previous two motifs. Then I added more motifs to come up with an arrangement that I liked. 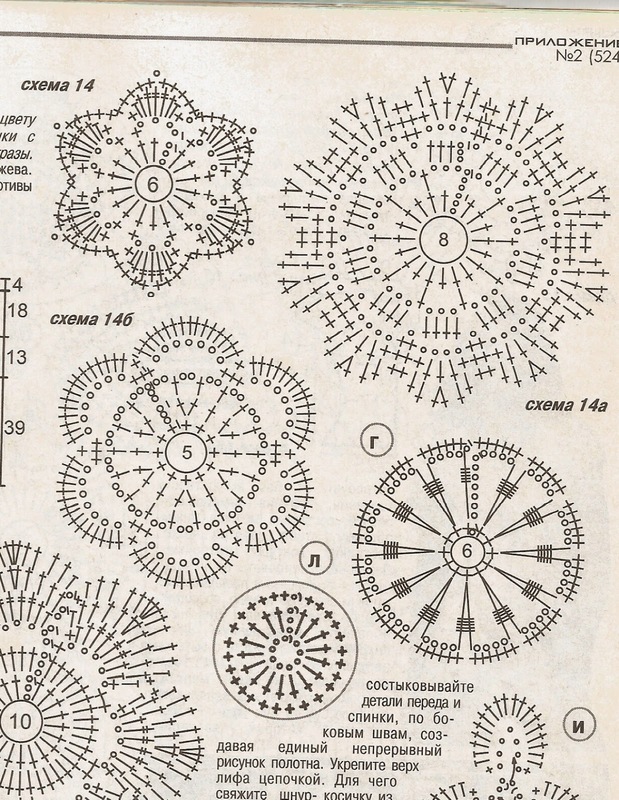 Anyway, here I include patterns of the motifs in crochet symbol charts from Zhurnal MOD No. 524. 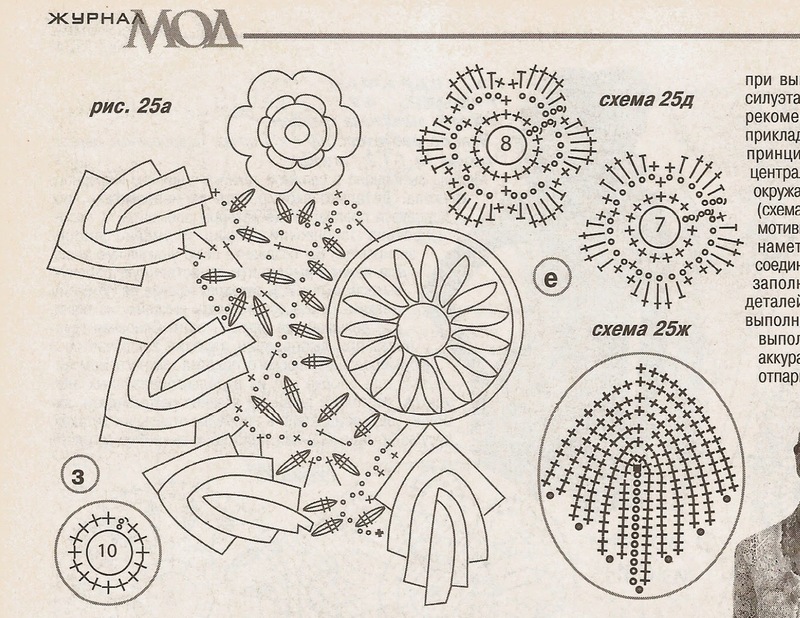 With these charts I hope you will be able to modify the patterns and make your own designs. The necklace consists of five different motifs in the center. 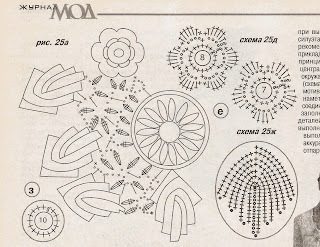 Four motifs of the same design are joined at each side of the center motifs. You can use the patterns of the motifs as you like – modify them as you desire and create your own designs. 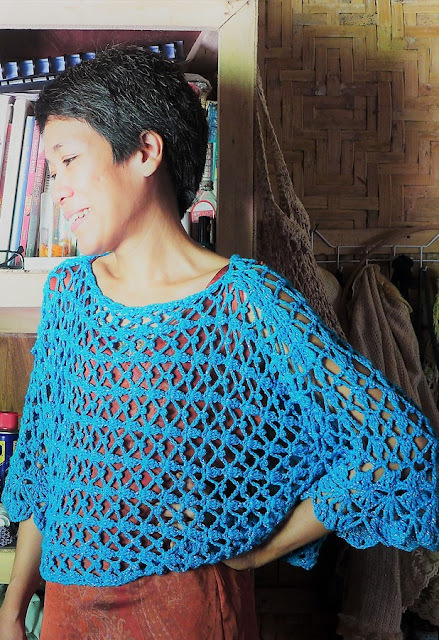 Apparently, you can make a motif blouse with this method. It would be similar to the blouses and dresses found in the Mod magazines. You will need crochet cotton thread size 8 or 10. Steel crochet hook size 1mm or 1.2mm. Ch 5. Sl st in first ch to make a ring. Rnd 1: Ch 1, 12 sc in ring, sl st in first sc to join. Rnd 3: Ch 5 (count as dc, 2-ch), dc in next dc, *ch 2, dc in next dc, rep fr * all around, ending with ch 2, sl st in 3rd ch of 5-ch to join. Rnd 4: Ch 1, sc in same st, sc in 2-ch sp, *ch 7, sk next 2-ch sp, sc in next 2-ch sp, sc in dc, sc in next 2-ch sp, rep fr * all around; end with ch 7, sc in last 2-ch sp, sl st in first sc to join. Rnd 5: Ch 1, sc in same st, 15 dc in 7-ch loop, *sc in middle sc of 3-sc, 15 dc in next 7-ch loop; rep fr * all around, ending with 15 dc in last 7-ch loop, sl st in first sc to join. Fasten off. Ch 4, sl st in first ch o make a ring. Rnd 1: Ch 1, 10 sc in ring, sl st in first sc to join. Rnd 3 (This rnd joins to the first big motif): Ch 1, in first 3-ch loop make sc, hdc, dc, sc in dc in tip of petal of first big motif, in same 3-ch loop make dc, hdc, sc; *in next 3-ch loop make (sc, hdc, 3 dc, hdc, sc); rep fr * on all 3-ch loops; sl st in first sc to join. Fasten off. Ch 6, sl st in first ch to join. Rnd 1: Ch 3 (count as dc), 11 dc in ring; sl st in first dc to join. Rnd 2 (This rnd joins to the First and Second Motif): Ch 1, sc in each of next 3 dc, 2 sc in next dc, sc in petal of First Motif (refer to Assembly Guide), sc in each of next 3 dc, 2 sc in next dc, sc in next 2 dc, sc in petal of Second Motif, sc in next dc, sl st in first sc to join. Fasten off. Rnd 4 (This rnd joins to the First and Second Motif): Ch 1, sc in same st, sc in petal of Second Motif (refer to Assembly Guide), 2 sc in 2-ch sp, sc in next dc, 2 sc in next 2-ch sp, sc in next dc, sc in petal of First Motif, 2 sc in next 2-ch sp, sc in next dc, 2 sc in next 2-ch sp, sc in next dc, sc in next petal of First Motif, *2 sc in next 2-ch sp, sc in next dc, rep fr * all around, ending with 2 sc in last 2-ch sp, sl st in first sc to join. Fasten off. Ch 3, sl st in first ch to make a ring. Rnd 1 (This rnd joins to the First Motif): Ch 1, 5 sc in ring, sc in petal of First Motif (refer to Assembly Guide), 5 sc in ring, sl st in first sc to join. Fasten off. Ch 8, sl st in first ch to make a ring. Rnd 1: Ch 1, 18 sc in ring. Sl st in first sc to join. Rnd 3 (This rnd joins to the First and Fifth Motif): Ch 1, in each of next 3 4-ch loops make (sc, hdc, 4 dc, hdc, sc); in next 4-ch loop make (sc, hdc, 2 dc, sc in petal of First Motif (refer to Assembly Guide), 2 dc, hdc, sc); in last 4-ch loop make (sc, hdc, dc, sc in sc of Fifth Motif (refer to Assembly Guide), 3 dc, hdc, sc); sl st in first ch to join. Fasten off. 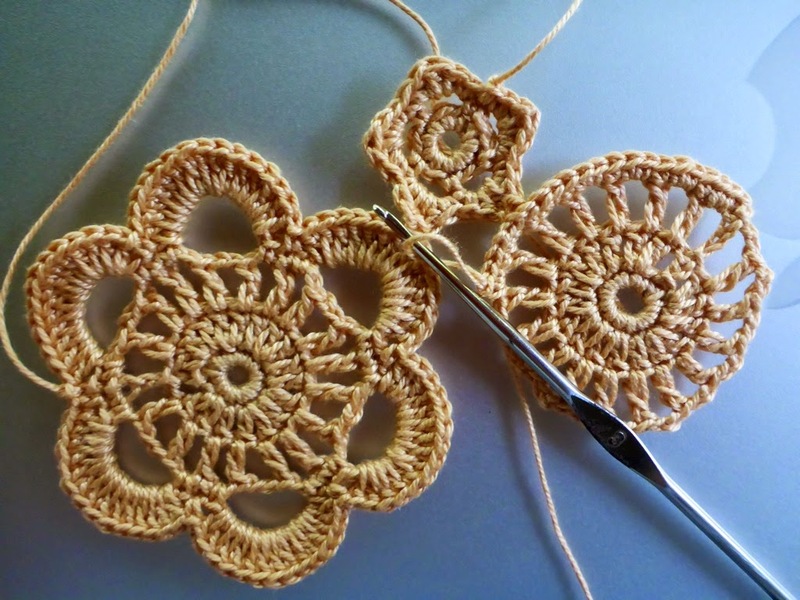 Make another Motif that joins to the Fourth Motif (refer to Assembly Guide). Rnd 1: Ch 1, 15 sc in ring. Sl st in first sc to join. Rnd 3 (This rnd joins to the Sixth Motif): Ch 1, in each of next 4 5-ch loops make (sc, hdc, 3 dc, hdc, sc); in last 5-ch loop make (sc, hdc, dc, sc in each of two dc in Sixth Motif), dc, hdc, sc); sl st in first sc to join. Fasten off. Make 5 more of this motif joining along two stitches in each petal. 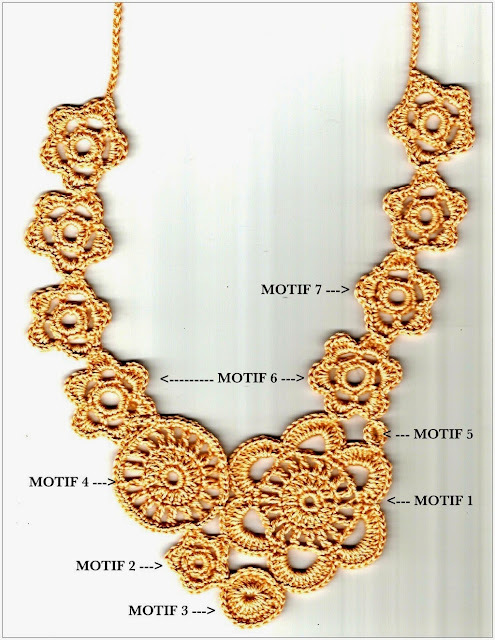 Join with sl st to petal of last motif of necklace, sc in each of 2 dc in petal, make ch at least 16 inches long. Fasten off. Repeat for other end of necklace. Knot end of ties.